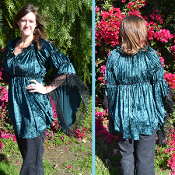 Our well-loved Gwendelyn Blouse, made in luscious velvet. Elasticized empire Waist with a drop sleeve and sweetheart neckline. Dress up your look with this easy to wear favorite.